One more thing about "elitism." What is most interesting, and least mentioned, in any discussion of this or that candidate's supposed "elitism" is the profound condescension it often shows toward the knowledge of the Average Man. Take, for instance, the Arugula Libel. Last year, Obama was addressing some Iowans and he said: "Anybody gone into Whole Foods lately and see what they charge for arugula?" he asked. "I mean, they're charging a lot of money for this stuff." This was taken as evidence of Obama's "elitism," that he is out of touch because he was talking about a supposedly exotic vegetable and a high-end supermarket in Jus' Folks Iowa. "Doesn't he know," went the response from the opinion factories of the East, "they only grow corn in Iowa and shop at the Hy-Vee, which certainly wouldn't stock something as highfalutin as arugula?" Democrats have been worrying about defending Mr. Obama's highly liberal voting record in a general election. Now they need to fret that he makes too many mistakes, from ignoring the Rev. Wright time bomb until the videotapes blew up in front of him, to his careless condescension towards salt-of-the-earth Democrats. Mr. Obama has a tendency to make such cultural miscues. Speaking to small-town voters in Iowa last year, he asked, "Anybody gone into Whole Foods lately and see what they charge for arugula?" Michelle Malkin, who long ago abandoned all debate tactics but the ad hominem smear, ran with the Arugula Libel, even producing a cute faux-poster depicting Obama with an arugula leaf. This would all be real trouble for Obama if Americans actually were as stupid and parochial as writers like Fund and Malkin believe they are. But they are not. Arugula, far from exotic, is grown in Iowa and is widely available at supermarkets and farmers' markets in the state. You can even get it at the Hy-Vee. If you're in Ames, you can buy arugula at the farmers' market there. In Mingo? Head to Cleverly Farms, which has abundant arugula. It is also telling that no article quoting Obama's arugula remark provides any context. Was he just bullshitting with the crowd about the price of foodstuffs? Or could it be that he knew farmers in Iowa grow arugula, and was trying, despite the constant clatter of nonsense he needs to speak over, to talk to them about their business, how generally they don't make a lot of money on their crops while companies like Whole Foods charge whatever they can get in a given market for their produce? I guess we'll never know, because long ago "reporters" decided the remark could only be used to characterize Obama as a salad snob. Do these guys even know what they're doing? Do they even stop to think that maybe, just maybe, despite it's several syllables, most Americans know what arugula is? And that by pretending to be shocked that a candidate would be so out-of-touch as to mention the leafy green in Iowa, they are insulting the intelligence of the American Everymen they are usually trying so hard to impress? The right-wing disinformation apparatus, and the pathetic individuals in the press and on television who continue to be intimidated by it—for example, everyone on CNN—have already settled on their tale of Obama, and, surprise, it sounds just like the tale of Kerry, which sounded just like the tales of Dukakis and Mondale. He's an "elitist." He likes fancy things plain folks don't get to have, like wine and salads not made of iceberg lettuce. If only the Democrats were smart enough to put out there a true man of the people. A heroic brush-clearer like George W. Bush, or an honest-to-God cowboy like Ronald Reagan. The Democrats just don't understand regular folks. It's starting to feel like a long, long way to November. Credit where it's due: Thomas Frank discusses at-length the Latte Libel in his amazing book, What's the Matter with Kansas? Obviously, the term was the inspiration for the Arugula Libel. Glenn Greenwald is one of the smartest and most consistent progressive bloggers. His new book, "Great American Hypocrites: Toppling the Big Myths of Republican Politics", is coming out April 15 and, although I might not be able to afford it just now (those hardcovers are pricey) I encourage everyone to read it. Today, Glenn summarizes his theory of the right-wing media-political establishment. As usual, he's on target. The other day, I watched Fox News "analyst" Karl Rove (that's really how they introduce him) literally go through the entire list of conservative distortions and lies about Barack Obama. Of course, Rove was not challenged on any of the statements by the host of the show he was on, On the Record with Greta van Susteren. One lie popped out at me. Rove said (I'm roughly quoting) "Obama told us he was a constitutional law professor, that turned out not to be true." This stuck out because it was his academic career that proved to me Obama's intellectual merit. Since I don't know him personally, I took as proof of a high level of intelligence Obama's tenure as editor of the Harvard Law Review and his job teaching at the University of Chicago School of Law. I don't have absolute faith in academics, but I know they don't let just anyone edit the Harvard Law Review. Since the claim came out of Rove's mouth I did not believe it, but I checked to make sure. So although to the law school Senior Lecturer is as good as professor, Obama's description of himself as a professor doesn't quite meet Rove's exacting standards for accuracy. Obama's former colleague at the University of Chicago Law School, Cass R. Sunstein, vouches for the candidate's intellectual diligence and ability to profess law in this essay. Hillary Clinton: a volunteer for the Vast Right-Wing Conspiracy? Harsh assessment for sure, but I would tend to agree with the argument. The photo is from the National Review. 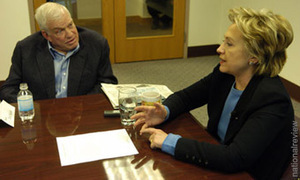 It shows Richard Mellon Scaife sitting to Clinton's right (I wonder if they planned that) at a meeting the candidate had with the editorial board of the Pittsburgh Tribune-Review. The reason the photo is of note is because it was at this editorial meeting that Clinton said Jeremiah Wright, Barack Obama's former pastor, "would not have been my pastor." Later, when Clinton was asked about the comment, she said she was only answering a question asked of her by the reporters at the meeting. The implication is she was taken off-guard by the question, and merely answered it without prior thought. Marshall asks the right question: Would not Clinton have had some idea about the kind of questions Mellon Scaife's reporters might have asked, and if she wasn't being willingly set up to take a swipe at Obama, could she not have somehow deflected the question? Obviously, it isn't incumbent on Clinton to aid her opponents; one would think, however, that it would be irresponsible to aid a longtime personal and political foe in attacking the Democratic Party. Hillary's own troublesome religious affiliation. Here’s a good preview of what Obama will be in for this summer and fall should he become the Democratic nominee. Lisa Shiffren writes in the National Review Online about her deduction that Obama’s parents must have been Communists, because mixed-race couples only met through the Communist Youth League. Shiffren’s is an paranoid screed; it informs the reader of nothing but the writer’s ignorance of American life. Never mind that Obama’s parents met at the University of Hawaii, as culturally and geographically far from New York as you can get in the United States—that doesn’t matter, because Shiffren remembers that most mixed-race couples, when she was young, were affiliated with Communists. Therefore, all mixed race couples must have been affiliated with Communists, and their offspring, regardless of the facts of the lives they have lived since they were born in the 1960s, must be secret Reds. I don't know how Barak Obama's parents met. But the Kincaid article referenced above makes a very convincing case that Obama's family, later, (mid 1970s) in Hawaii, had close relations with a known black Communist intellectual. And, according to what Obama wrote in his first autobiography, the man in question — Frank Marshall Davis — appears to have been Barack's own mentor, and even a father figure. Of course, since the Soviet Union itself no longer exists, it's an open question what it means practically to have been politically mentored by an official Communist. Ideologically, the implications are clearer. So Shiffren was so lazy she couldn’t spend two minutes finding out that Obama’s parents met at the University of Hawaii, but she’s certain—because she read it in an article—they had “close relations” (note the double entendre) with a “known” (as opposed to a phantom) black Communist intellectual. She would also have read in the article that it accuses Obama of keeping company with this man “at some point in time” between 1971 and 1979—when Barack was between 10 and 18 years old, or, as a thinking person would recognize, before he went off to college and law school and met the people and did the things which made him a mature man. Political correctness was invented precisely to prevent the mainstream liberal media from persuing the questions which might arise about how Senator Obama's mother, from Kansas, came to marry an African graduate student. Love? Sure, why not? But what else was going on around them that made it feasible? Before readers level cheap accusations of racism — let's recall that the very question of interracial marriage only became a big issue later in the 1960s. The notion of a large group of mixed race Americans became an issue during and after the Vietnam War. Even the civil-rights movement kept this culturally explosive matter at arm's distance. It was, of course, an explicit tactic of the Communist party to stir up discontent among American blacks, with an eye toward using them as the leading edge of the revolution. To be sure, there was much to be discontented about, for black Americans, prior to the civil-rights revolution. To their credit, of course, most black Americans didn't buy the commie line — and showed more faith in the possibilities of democratic change than in radical politics, and the results on display in Moscow. Time for some investigative journalism about the Obama family's background, now that his chances of being president have increased so much. Years ago, someone invented “political correctness” because they knew one day Obama would run for President and he would need its cover? Sounds implausible. All right, cheap shot, I suppose; I stick to the execrable substance and not the execrable structure of Shiffren’s writing. But her point is just as ridiculous. She’s saying the only reason the “mainstream liberal media” won’t call Obama’s parents Communists is because of the doctrine of political correctness—in other words, there’s no chance the charge might be false, they can only be concealing the facts. Perhaps Shiffren has a better grasp of Communism than I give her credit for; she certainly reasons like a apparatchik. The rest of the article doesn’t make any sense. Shiffren says what makes the Obama’s marriage “feasible” was the Communists’ agitating among American blacks. They might have married for love, but it was such agitation that allowed them to marry. Therefore—Shiffren seems to be saying this, one can’t be sure—they owe a debt to the Communists. I suppose I’ll end this by saying it’s apparent Shiffren does not even know Obama’s father was not a black American from Newark or Detroit, but a Kenyan who came to study in Hawaii in the early 1960s. More right-wing Obama smears will be rebutted tomorrow. The National Review Online needs help. I'm clearly not a conservative, but I used to enjoy this publication. Lately, though, it's been like a friend whose mind is slowly deteriorating into a few repetitive, paranoid thought patterns. It's gotten so bad that most of the magazine is dedicated to supposing that anything any "liberal" does is motivated by either self-love or hatred of America. I won't even get into the editor's hilarious new book. I know, I know, Barack Obama is the post-racial candidate — he, and we, are past all that deplorable old race stuff, went through it and came out the other side, doesn't matter, don't care, couldn't possibly be less important. Yet the evidence is plain that Barack and Michelle Obama both belong to that subset of educated black Americans to whom their own blackness is of obsessive interest, or at very least was up through their college years. Barack famously wrote "A Story of Race and Inheritance", about his own long struggles with his racial identity. I know Derbyshire is English, but he is a writer on American politics, so he must have some sense of the racial experience in this country. He is either ignorant or disingenuous. I would wager the latter. Anyone who has known real African-American men and women knows it still means something in this country to be born black. Thinking and analyzing one's group identity, particularly when that identity is as strong as it is for African-Americans, is not "obsessive." It shows a desire for self-knowledge Derbyshire ought to emulate. Look, I'm willing to make allowances. Both these people grew up in the Me Decade when self-obsession was for a brief horrible moment as American as apple pie. Still, 1985 was over two decades on from the Civil Rights Act, three from Brown v. Board of Ed.. Far from being barred from life opportunities, black Americans were being given a hand up — affirmative action was in full swing. Countless black Americans of the Obamas' generation found something better and more useful to do with their lives than fret 24/7 about their own blackness. Some of them even went into politics. Maybe I misread, but Mrs. Obama's thesis was not titled "Princeton-Educated Michelle Obama and the Black Community," so it's hard to see what her scholarly work has to do with the "Me Decade." Surely Derbyshire does not consider scholarship on one's own community to be a form of narcissism. Would he have the same reaction to a woman who was the daughter of a tenant farmer in Yorkshire, and then went on to Oxford to write a thesis about the culture of farmers' children at elite English universities? I doubt Derbyshire would question the premise of such a work; why, then, begrudge Mrs. Obama's examination of her culture? I think I know the reason. Maybe I'm jaded, but I really need persuading that when I look at Barack Obama, I'm not just seeing Al Sharpton minus the pompadour and the attitude. And so Derbyshire sayeths the ultimate conservative libel onto a black politician: you are like Reverend Al. Because Obama exploits race to stay in the news despite his obvious political irrelevance? No, Obama can't be said to do that, nor does he need to. He's like Al Sharpton because he and his wife have a history of acknowledging and analyzing their race. Good work, Mr. Derbyshire. It should be noted that Derbyshire is a racist in the English Colonial tradition; i.e., he believes white skin makes one more intelligent than anyone with darker skin. Compared to Barack and Michelle Obama, Derbyshire becomes a living refutation of his own beliefs.